Since Coursera so kindly seems to share courses it thinks I might find useful, as a CogDogBlog Snarkity Service, I have sent them an email with a few course recommendations. 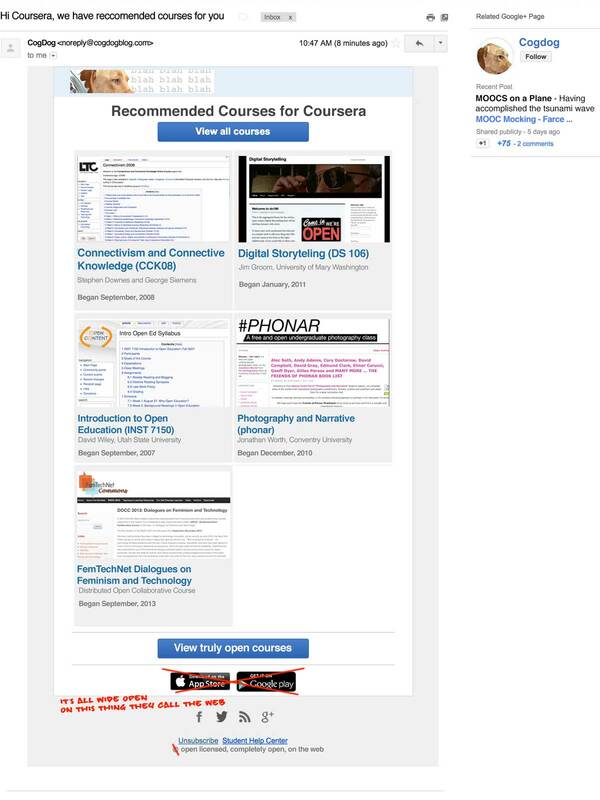 They seem to know very little about other open courses, and what came before (and after) them. This was constructed completely in Photoshop after gluing together some screen caps. The text in chrome seems to be all Helvetica. As much as possible, the screen captures were of the oldest relavant pages I could find for the sites. Phonar is still alive I used the oldest found archive in the Way Back Machine. Didn’t want to waste a whole comment on a snarky chuckle but…sorry, it this was worth it. Bahahahaha. No comment, especially one with a snarky chuckle, can be considered waste here. I get so lonely for comments I sometimes read my spammed ones. I just received another of these Coursera emails today and then ran into this. Golden. I sure wish I stumbled into this community years earlier. Regardless, here I am.